A NEW YORK TIMES, WALL STREET JOURNAL, and TIME TOP 10 BOOK OF THE YEAR The definitive, dramatic biography of the most important African American of the nineteenth century: Frederick Douglass, the escaped slave who became the greatest orator of his day and one of the leading abolitionists and writers of the era. As a young man Frederick Douglass (1818-1895) escaped from slavery in Baltimore, Maryland. He was fortunate to have been taught to read by his slave owner mistress, and he would go on to become one of the major literary figures of his time. He wrote three versions of his autobiography over the course of his lifetime and published his own newspaper. His very existence gave the lie to slave owners: with dignity and great intelligence he bore witness to the brutality of slavery. Initially mentored by William Lloyd Garrison, Douglass spoke widely, often to large crowds, using his own story to condemn slavery. He broke with Garrison to become a political abolitionist, a Republican, and eventually a Lincoln supporter. By the Civil War and during Reconstruction, Douglass became the most famed and widely travelled orator in the nation. He denounced the premature end of Reconstruction and the emerging Jim Crow era. In his unique and eloquent voice, written and spoken, Douglass was a fierce critic of the United States as well as a radical patriot. He sometimes argued politically with younger African Americans, but he never forsook either the Republican party or the cause of black civil and political rights. In this remarkable biography, David Blight has drawn on new information held in a private collection that few other historian have consulted, as well as recently discovered issues of Douglass's newspapers. Blight tells the fascinating story of Douglass's two marriages and his complex extended family. Douglass was not only an astonishing man of words, but a thinker steeped in Biblical story and theology. There has not been a major biography of Douglass in a quarter century. David Blight's Frederick Douglass affords this important American the distinguished biography he deserves. 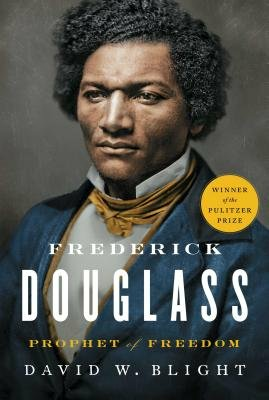 David Blight's extraordinary new biography, Frederick Douglass: Prophet of Freedom, captures the complexities of the man who lived and died at Cedar Hill: a figure both eminent and solitary who gazed across vastly different American landscapes.... Frederick Douglass: Prophet of Freedom is the first full biography in a quarter-century. Blight, an eminent Yale historian and author of several other acclaimed works on slavery, race and the Civil War era, has produced one well worth the wait.... Douglass himself was apparently never recorded by the phonograph operators. But in Blight's pages, his voice again rings out loud and clear, melancholy and triumphant  still prophesying, still agitating, still calling us to action. In one of the year's most impressive biographies, Yale historian David W. Blight captures the many sides of this complex man. Blight has spent the better part of his scholarly career pondering Douglass' odyssey. Even if the author's prose can shade into a fulsome ripeness, "Frederick Douglass: Prophet of Freedom" is superb. It gives a full portrait of Douglass' political evolution, his family life and the emotional upheavals born of Douglass' unlikely trajectory from slave to, as he often put it, a "self-made man." As the historian David W. Blight shows in his cinematic and deeply engaging Frederick Douglass: Prophet of Freedom, white abolitionists like William Lloyd Garrison were smitten with Douglass, instantly recognizing the value of a recruit just out of chains whose eloquence refuted the claim that Negroes were inferior and who could condemn slavery as immoral by drawing on America's founding documents as well as his own bitter experience under the lash.... Blight draws on new archival material and insights gleaned from a lifetime in the company of his subject to shed light on the orator's complex relationship with his wife, Anna, and the two white women who came between the couple within the walls of the Douglass family home in Rochester. ...exquisitely researched and incisively argued... This book is a richly detailed intellectual biography, full of new sources and interpretations that add clarity, meaning and verve to Douglass' personal story.... His new book is unquestionably the best account of Douglass' complex and epic life. Blight's writing is consistently engaging and, despite his biography's heft, lean and measured.... Blight's book is a stunning achievement, executed with clarity and unpretentious elegance. It may not be the last Douglass biography, but it is one for the ages. ...[an] authoritative, meticulously researched biography... Blight's arc traces the familiar lines of Douglass' story...but assiduously fleshing it out with rich detail and context.... This is scholarship on an epic yet accessible scale, occasionally dry but always vital, as Douglass' writing, activism and contradictions speak directly to us today.... Frederick Douglass: Prophet of Freedom is nothing if not a doorstop, and Blight's exhaustive, donnish approach may not suit every reader's palate. But it's a commanding account of a singular life, a sumptuous portrait of a crusader unyielding in his pursuit of racial justice. Blight, who has edited and annotated volumes of Douglass's autobiographies, undertakes this project with the requisite authority and gravity. The result is comprehensive, scholarly, sober... Blight's book really comes into its own in the later chapters, as it conveys Douglass's trajectory through Reconstruction, his support for (and split from) the women's suffrage movement, and beyond.... Blight isn't looking to overturn our understanding of Douglass, whose courage and achievements were unequivocal, but to complicate it  a measure by which this ambitious and empathetic biography resoundingly succeeds. Mr. Blight beautifully explains how Douglass used language as a source of inspiration that would lead to freedom.... Mr. Blight's biography deserves full immersion. Though long, it is absorbing and even moving, and the payoff is enormous, for Mr. Blight displays his lifelong interest in Douglass on almost every page, and his own voice is active and eloquent throughout the narrative. It is a book that speaks to our own time as well as Douglass's.... It is a brilliant book. Mr. Blight, bringing new material to the historical record, focuses on the great orator's role as public figure, political operative, and patriarch of a restive family.... A masterful, comprehensive biography such as Mr. Blight's is particularly welcome in times such as these, when politicians such as the president are gleefully stoking the same racial divisions that Mr. Douglass spent his life trying to extinguish. David Blight has written the definitive biography of Frederick Douglass. With extraordinary detail he illuminates the complexities of Douglass's life and career and paints a powerful portrait of one of the most important American voices of the 19th century.... The resulting chronicle enriches our understanding of Douglass and the challenges he faced and offers a lesson for our own troubled times. It's hard to imagine a biographer more knowledgeable about Douglass's life, times and writings than David W. Blight, who indeed knows so very much that one of his occasional turns to the reader is to pose a series of non-rhetorical questions... This grand and timely biography, Frederick Douglass: Prophet of Freedom, is ever authoritatively informative, but it travels at a safe and steady 25 m.p.h. on a straight road while Douglass's life was often a dangerous and boundless adventure. Where Blight is best is investigating those topics where the usually intrepid Douglass hesitated to tread... Read, I suggest, as the earnest biographer perhaps expects us to have already done, at least "Narrative of the Life of Frederick Douglass, an American Slave, Written by Himself," and then stock up on the helpful context of Blight's thorough biography.